A central object of this book is the discrete Laplace operator on finite and infinite graphs. The eigenvalues of the discrete Laplace operator have long been used in graph theory as a convenient tool for understanding the structure of complex graphs. They can also be used in order to estimate the rate of convergence to equilibrium of a random walk (Markov chain) on finite graphs. For infinite graphs, a study of the heat kernel allows to solve the type problem—a problem of deciding whether the random walk is recurrent or transient. 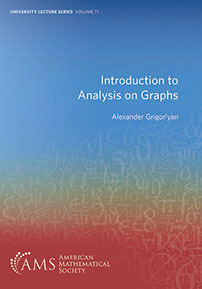 This book starts with elementary properties of the eigenvalues on finite graphs, continues with their estimates and applications, and concludes with heat kernel estimates on infinite graphs and their application to the type problem. The book is suitable for beginners in the subject and accessible to undergraduate and graduate students with a background in linear algebra I and analysis I. It is based on a lecture course taught by the author and includes a wide variety of exercises. The book will help the reader to reach a level of understanding sufficient to start pursuing research in this exciting area. Undergraduate and graduate students and researchers interested in random walks on graphs and groups. Anybody who has ever read a mathematical text of the author would agree that his way of presenting complex material is nothing short of marvelous. This new book showcases again the author's unique ability of presenting challenging topics in a clear and accessible manner, and of guiding the reader with ease to a deep understanding of the subject.